For Bogotá’s 15th annual car-free day yesterday, residents had the chance to walk and bike together in their city’s streets to build a year-round culture of sustainable mobility. Photo by Carlos Felipe Pardo/Flickr. Yesterday, Bogotá, Colombia celebrated the 15th anniversary of its annual car-free day. Between 5am and 7:30pm, residents left their cars behind and turned to a variety of other modes of transport—a symbolic act that 63 percent of citizens institutionalized through a public referendum in October 2000. This year’s car free day, however, introduced a restriction on motorcycles as well, removing a major source of traffic fatalities and air pollution from the roads for a day. In a city of over 7 million people, the absence of 600,000 private vehicles from the streets made a visible difference. Like many other growing cities, Bogotá has grappled with air pollution and car-related traffic fatalities. According to Americas Quarterly, the number of registered private vehicles has risen 76 percent in the past seven years, and respiratory illnesses are the number one cause of infant mortality in the city, with a staggering 600,000 children under the age of five treated annually for breathing-related problems. Furthermore, 322 pedestrians and 56 cyclists were killed in 2014 to car-related accidents, and drivers lost an average of 22 days from waiting in traffic. However, designating an entire day as car-free means that the city needs to provide dependable alternatives so that residents can still reach their normal destinations. Fortunately for residents, Bogotá is a global leader in supporting transport infrastructure that is sustainable and people-oriented. The city is home to a number of urban mobility innovations, many the result of former mayor Enrique Peñalosa’s time in office. For example, Bogotá boasts the TransMilenio—one of the world’s most successful bus rapid transit (BRT) systems. TransMilenio opened in 2000—the same year as the city’s inaugural car-free day, currently employs 40,000 people, and indirectly supports another 56,000 jobs, while reducing greenhouse gas emissions by almost 250,000 tons annually. 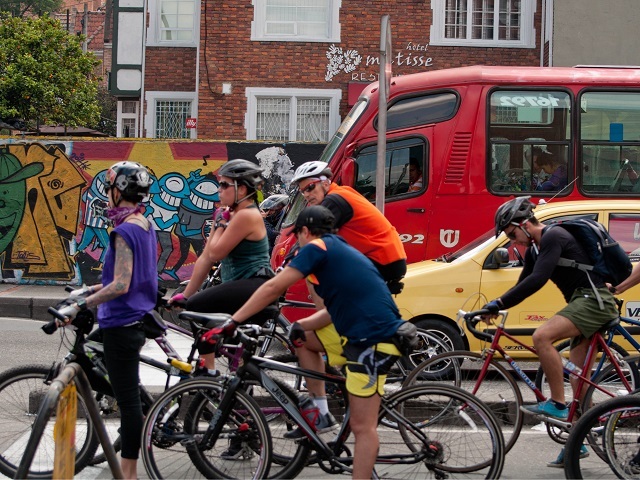 Bogotá has also long been a haven for bike enthusiasts, daily commuters, and casual riders alike. Since 1974, popularity has exploded for the city’s traditional “Sunday Ciclovías.” Every Sunday, the city closes its streets to cars so that people can both ride in safety and also participate in a symbolic event centered on public health and community building. For this year’s car-free day, the city expanded its bike lane network to 392 kilometers (244 miles) and added 2,700 new bike parking stations near TransMilenio stations—a great step in making Bogotá’s public transport more multi-modal and integrated. What would the future look like if Bogotá and other cities made the car-free idea not just an exception for one day, but a normal fact of urban life? Recently, we explored this question and took a look at EMBARQ and IDEO’s thought-provoking project to reimage urban mobility around the world. In the meantime, cities like Jakarta, Indonesia, Chengdu, China, New Delhi, India, and Mexico City, Mexico among others are beginning to experiment with car-free days and other ways of decreasing our unsustainable reliance on cars. Making long-term sustainable mobility a reality is about not only embracing people-oriented planning and design, but also changing the image of cars and the public’s perception of alternative modes. Single car-free days may not always have a significant environmental impact in the short term, but they have the power to spark discussion, raise awareness, and gradually change transport norms and attitudes. Bogotá’s annual car-free day isn’t just about getting people out of their cars for a day—it’s about showing that other possibilities for urban mobility exist.